While on vacation Death has lost his keys to the Underworld. Apparently, he also forgot to lock the door as monsters have begun to escape. Zombies, vampires, ghosts and more are now wandering around the mortal realm. This is an especially irritating problem for Death since he is on holiday. Rather than cleaning up the mess himself, Death hires Grog, the local graveyard gardener to retrieve the keys to the underworld. Grog takes his lawn mower and proceeds to save the day, with the player’s help of course. Confused yet? Drakhar Studios’ self proclaimed original story is certainly unique. Grumpy Reaper gameplay and maps seem very reminiscent of the classic Zombies Ate My Neighbors. Either way you look at it the mechanics involved are certainly interesting. The goal is to navigate Grog, with his upgradable mower, around the map to cut all of the grass without being caught by a monster. The game has many upgradeable and customizable options. You can power up your mower to take down higher level monsters, utilize potions and spells, upgrade armor, and spend in game currency to purchase fuel and other items. As you progress through the levels more monsters are unlocked that may be customized as well. While the longevity of the game, and how fun it is from start to finish remains unclear, Grumpy Reaper seems like it has the potential to be entertaining for a while. It’s level design makes the game good for quick pickup and play sessions while the unlockable and customizable features may keep you coming back for more. 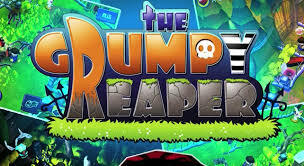 Stay tuned for more about Grumpy Reaper on the Wii U eShop. Have you played Grumpy Reaper? Let us know in the comments!